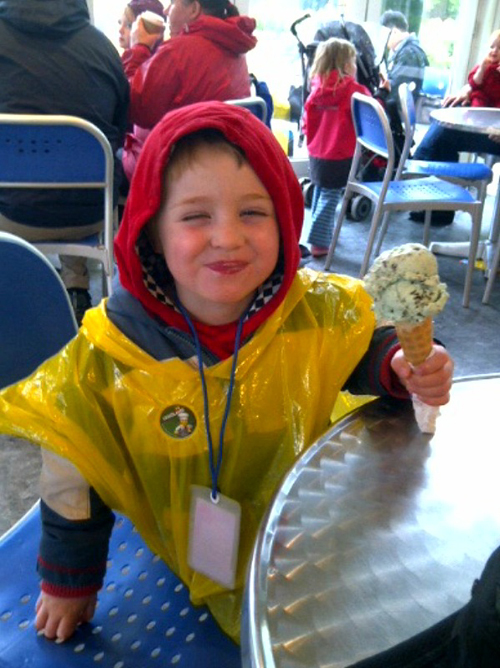 A Blog Of Ice Cream: Mint Choc Chip In The Rain - No Worries! My recent ice cream blog post about Ice Cream For A Queen mentioned how people would be celebrating the Diamond Jubilee with street parties and concerts, etc. The celebrations were spread over 4 days up and down the length of Britain as well as in Commonwealth countries like Canada and Australia. In Britain the weather was not the expected sunny, warm spell that everyone had hoped for. There was a lot of rain in some places. Even so, it didn't dampen the spirits of people in their keenness to celebrate and have a good time. Here is Dylan, phtographed by his dad Paul at a fun park near London over the Jubilee weekend. As you can see, it had been raining and although many children might look glum dressed in a plastic raincoat, unable to enjoy the outdoors .... not Dylan! An ice cream treat of a delicious mint choc chip cone was all he needed to stay happy. Simple but delightfully innocent and heartwarming. Dylan has loved ice cream since he was a baby - check out one of my previous ice cream blog posts entitled 'The Ice Cream Smile' from 2010 when Dylan was still in his high chair and see what he was doing with ice cream even then! Thanks to Dylan's Dad Paul for kind permission to use his photos.